Author and journalist Ta-Nehisi Coates discusses white supremacy and writing at a Wednesday event. The event, hosted at Evanston Township High School, was moderated by ETHS Principal Marcus Campbell. 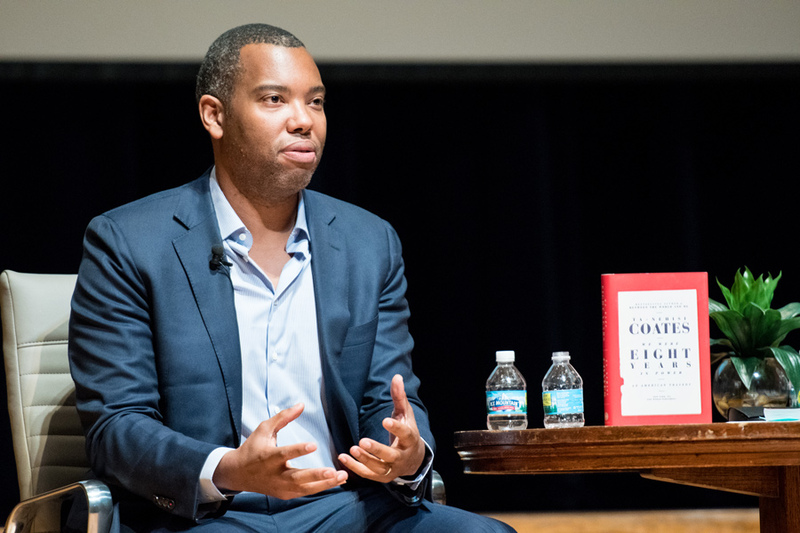 Author and journalist Ta-Nehisi Coates said at a Wednesday discussion that the first step in dismantling white supremacy is through truthful representation of history. At a public event hosted by Evanston Township High School, Coates told more than 1,400 audience members that false narratives and racist beliefs are deeply ingrained in the United States. The talk was organized by Family Action Network, a nonprofit that curates free speaker series on a variety of topics. Coates said Americans are “lying” to themselves about segregation and discrimination. He added that he tries to use his work to get people to face the reality of the past. ETHS Principal Marcus Campbell, who moderated the event, told The Daily that bringing Coates to Evanston allows people to learn about his work and understand the role race plays in society. “Racism is real, and (Coates is) demonstrating that in ways a lot of people can understand,” Campbell said. She said the discussion complemented the ETHS curriculum because Coates’s second book, “Between the World and Me,” is taught in classrooms. Coates also discussed what it means to be an African-American writer, saying that systemic exclusion and discrimination gives African Americans “the greatest perspective” on how to observe and write about the U.S.
During the Q&A period, an audience member asked Coates how he deals with the anger of injustices. Coates said he funnels it into his writing. Still, he said, black people should stop apologizing for their anger because it’s a natural emotion. Coates said black communities are often deprived of basic services like good schools and public libraries despite paying taxes. “If somebody has robbed you and you are in a community in which everyone around you has been robbed, and the robbery is ancestral, you’re right to be angry,” he said. Melanie Buck-Mandisodza, an Oak Forest, Illinois, resident who attended the event, told The Daily that Coates’ work “gives voice to the voiceless” by popularizing underrepresented narratives. Buck-Mandisodza said she appreciated that Coates addressed the burden that African Americans shoulder in having to always represent themselves. She added that this idea often isn’t an easy one to grapple with.